Kohima, the capital of Nagaland, is rich in natural beauty. The green landscape and the natural vegetation of the place is worth visiting. Kohima also has sanctuaries, peaks, valleys and parks. The following are the nature and wildlife of Kohima. The Pulie Badze Sanctuary situated at Kohima is the only protected area and sanctuary located within the Greater Kohima Planning Area. It is an important catchment area of the Kohima town. It is spread over an area of 9 sq km. The sanctuary is surrounded by green hills and beautiful streams. It is preserved by the Forest Department of Nagaland. The Forest Department of Nagaland is responsible to protect it from any kind of encroachment. The Sanctuary is the home to many rare and endangered avi faunal species. The rare species of bird spotted in the sanctuary are Blyth’s tragopan and dark rumped swift among others. It is an ideal place for bird watching. Khonoma is a village situated at Kohima. It is the first village in Nagaland to be awarded the Green Village Project. Khonoma is a place of beautiful landscape, dense forest and the paddy fields. The name of the village Khonoma comes after the khwuno plant. The reputation of the village is mainly that of the warrior village. In the 1830’s the people of the village put up the fiercest resistance to the advance of the East India Company. The Battle of Khonoma in 1880 culminated in the seize of the Angami village followed by a treaty. It is the first village in Nagaland that has banned logging and hunting. It is also the first village in Nagaland to be awarded the Green Village Project. The village is inhabited by the Angami tribes, a war tribe and Khels. The Khel is a clan based system of settlement. A tribal community living concept called age groups is followed in the village. At around 9-10 years a child joins an age group hosted by a village superior referred as father. Under the father the youth learns moral and social education, sports, preparation for welfare, singing, dancing and folklore. Each age group takes part in maintaining hygiene, beautification of roads and so on. The concept of feast of merit is an important aspect of their lives. It is an hounour to host a feast for the whole village. Eco tourism is promoted in the Khonoma village. The beautiful terraces carved out of the hill slopes surrounding the village add to its beauty. These terraces grow over 40 types of paddy at different elevation. Stone monuments are found in the village commemorating achievement during war or regular social lives. The Union Ministry of Tourism and Culture promotes eco tourism in Khonoma through the Khonoma Green Village project which is initiated by the villages in collaboration with the Centre for Environment Education. The Tragopan sanctuary is located at Khonoma. It is situated about 21 km from Kohima. The sanctuary was set up in 1998. It is privately owned and managed by the Khonoma Village community. It was set up to protect the rare blyth’s tragopan. It is a unique specimen of community initiative for wildlife and environment conservation. Tragopan sanctuary is perched at an altitude of 1200 metre above the sea level. The place is spread in an area of 70 sq km. It is endowed with rich forest cover and has rare biodiversity. Many endangered species of plant life and many medicinal plants are found in the sanctuary. The sanctuary is the ultimate destination for the trekkers and hikers. Japfu Peak is the second highest peak in Nagaland. The peak is situated at an elevation of 3048 metres above the sea level. One of the primary attractions of the Japfu peak is the existence of the tallest rhododendron tree. It is over 109 feet tall and the girth measure more than 11 feet. It has been featured in the Guinness Book of World Records. From the hump of the peak the beautiful sunrise could be viewed in November. The entire valley is surrounded by lush greenery. From the hill top tourists can have a bird’s eye view of the entire Kohima city. The thick bamboo trees of the Japfu range and the snow-capped peaks are sure to catch the attraction of the tourists. The peak is the ultimate destination of the trekkers and hikers. The best season for climbing the mountains is from November to March. The hilly terrain of Dzulekie is located 40 km west of Kohima. It is situated at a height of 2133.6 m. Dzulekie is dotted with the mithun or bison, the state animal of Nagaland. From June to September the entire Dzulekie valley is covered with a carpet of wild flowers. The place at this time of the year is like a paradise to the nature lovers. The valley is surrounded by hills, natural caves, rocks, deep gorges and cascading waters. It is also ideal for camping. Trekking is also an ideal option for nature lovers. A major attraction of Dzulekie is the Dzulekie stream that flows through a narrow gorge. The stream that cuts through the terrain provides habitat to a rare species of Rainbow Trout. The surrounding forest is home to the rare blythe’s tragopan, a pheasant species. Mithun or bison could also be spotted in the areas. Dzukou valley is located at the border of Nagaland and Manipur. The name of Dzukou valley comes from the Angami word meaning cold water. There is an ice cold stream flowing through the valley. The valley is situated at an altitude of 2438 metre above the sea level and is situated behind the Japfu peak. The area of the beautiful valley has been claimed as their parts by the states of Manipur and Nagaland. The political area of Manipur covers a major part of the valley while the inhabitants of the valley are Nagas. Therefore, both the states claim that the valley is a part of their state. Dzukou Valley is known for its eternal beauty having green rolling hills, interspersed by gentle flowing stream. The valley is one of the most beautiful places of Kohima in Nagaland. Dzukou valley is also known as the valley of flowers in the Northeast. 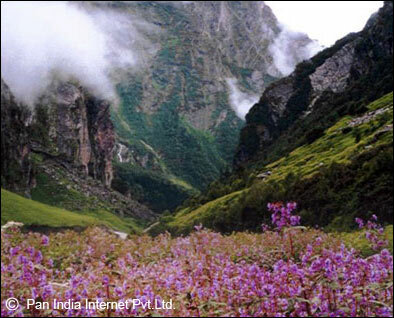 During the rainy season the entire valley is covered by carpet of wild flowers. The valley is covered by shrubs and herbs. White and pink lilies, euphorbias, aconiyums and other botanical plants could be spotted in the valley. Thick bamboo trees and rhododendrons are found in abundance in the valley which enhances the beauty of the place. The valley is beautified by gentle flowing stream. It is an ideal place for trekking and hiking. The hills, nature caves and rocks of the valley facilitate trekking. The best time to travel to the valley is during the month of June to September. Zoological park is one of the important attractions of Kohima. It is also called Kohima Zoo. It is situated on a hill top. The zoo is the home to the state bird of Nagaland, the endangered tragopan. It is also home to the wild buffalo, popularly known as mithun. The golden langoor is also seen in the zoo. There are many species of birds in the zoo. Bird watching is an important activity in the zoo premises. The zoo also facilitates camping and jungle safari. The Kohima zoo is also an ideal picnic spot.